Set of 20 A4 tabbed dividers. A4 manilla dividers ideal for filing. 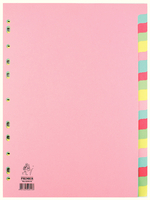 Each tabbed page is a different colour, so you can colour code your documents easily. Tabs have been left blank to add your own labels. Multi-punched to fit any standard folder or file. Approx Dimensions (CM): D30.1 W22.2 H0.5. Approx Weight (KG):0.1461.